Cardinal Oscar Rodriguez of Honduras met UN officials today as talks in Durban on climate change continued. The Cardinal is representing Caritas Internationalis at the UNFCCC meeting along with Caritas members from South Africa, Kenya, Bangladesh, and the British Isles. Some 25,000 government officials, lobbyists and scientists are expected to attend the two-week conference that is seeking a new deal to follow the 1997 Kyoto Protocol. Cardinal Rodriguez met with UNFCCC Chief of Staff Daniele Violetti to discuss the impact of climate change on the world’s poor and the importance of faith leaders in mobilising support for action. Violletti stressed the importance of bottom-up pressure from civil society and faith groups in combating climate change. This Sunday, Pope Benedict XVI’s called for delegates at the climate talks to agree a responsible and credible deal to cut greenhouse gases. “I hope that all members of the international community agree on a responsible and credible response to this worrisome and complex phenomenon, taking into account the needs of the poorest and future generations,” said the Pope at the Sunday Angelus in Rome. In Durban, Cardinal Wilfred Napier told a special Mass on Sunday that the season of Advent offered hope of a new beginning and that the Durban conference also held out hope for a new start for humanity if delegates seized the chance with a new deal. Cardinal Rodriguez reflected the concerns and message of the Pope in meetings Tuesday, saying the science was clear on the damage climate change will cause and the first-hand experience of Caritas staff in emergencies shows the poor will suffer the greatest. What is missing, he said, is political will. Caritas is calling for a legally binding deal that will put in place the cuts in greenhouse gases necessary and the financing to help poor country’s adapt to the worst consequences. A deal is in the balance as delegates argues over who cuts first and deepest and how to pay to support developing countries. Delegates from developing countries repeated the need for a multilateral legally binding agreement, but a post-Kyoto deal received a blow with Canada announcing Canada’s announcement that it would not accept further emission cuts under the treaty. 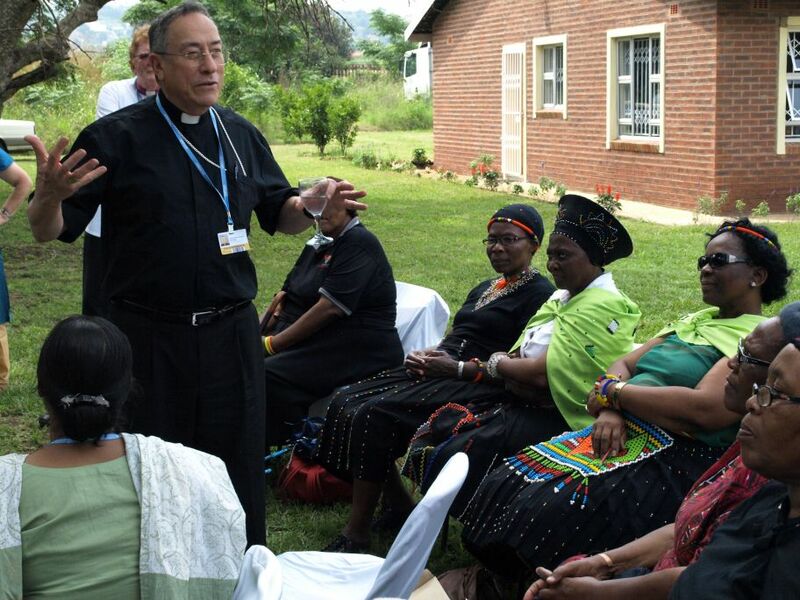 Later in the day, Cardinal Rodriguez and a group of Caritas representatives from various countries visited a local parish in nearby Kwa Mashu that is supported by Caritas South Africa. They heard pleas from people about the need for a deal at the climate talks and how floods and bad weather were affecting them.